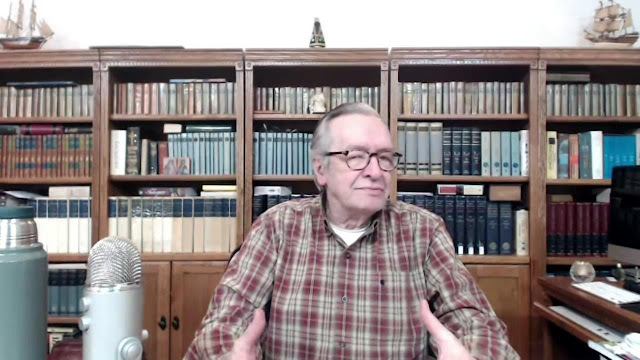 In a video published on January 27, 2019, Olavo de Carvalho called for the Brazilian Federal Police to investigate me on the grounds that I am an “attacker with connections to the Russian government,” as if the exposés I make about him were some conspiracy in which I am paid by the Russian government to disrupt his “wonderful” plans to save Brazil. The implication of his complaint is that I am paid by the Russian government to “attack him,” and this, according to his allegation, deserves the actions of the Federal Police. That is, in his view it is impossible for my exposés against him not to have the collaboration of the Russian government, indicating that exposing his ideas of the Inquisition and occultism are a matter of national security and, to protect his ideas from these exposés, he alleges that such exposés are a “foreign intervention” worthy of a Federal Police investigation. There is no escaping the fact that such a mode of thinking is similar to the way of thinking of Islamic and communist dictatorships. Whenever a blogger’s view bothers, a totalitarian regime (communist China, Saudi Arabia, North Korea, etc.) claims that the blogger violated national security and is involved in some foreign conspiracy. The Bolsonaro administration in Brazil has already made an ugly mistake by following some “suggestions” from Carvalho, appointing two ministers suggested by him. These appointments have displeased Brazilian generals, who have publicly criticized Carvalho’s ministers. According to Carvalho, these suggestions were made through his public videos. If the Bolsonaro administration follows the latest video “suggestion” of Carvalho — of a Federal Police investigation against Julio Severo over alleged conspiracy by the Russian government against his ideas, which have become a matter of national security —, Brazil is going to lower itself to the level of communist China, Saudi Arabia, North Korea, etc. Sooner or later, he will call for an investigation of the Federal Police against the generals, for the simple fact that they do not recognize his supreme greatness that all his adherents who have undergone brainwashing recognize. The generals are worried about that. One of them, General Paulo Chagas, wrote yesterday a Facebook post curiously entitled “Olavo ‘Rasputin’ de Carvalho.” As it is well known, the name Rasputin was given to Carvalho by me months ago in the article “Jair Bolsonaro’s Rasputin? How to Weaken a Right-Winger.” It seems the generals are reading my articles. Will Carvalho now say that the generals are being influenced by “Russian propaganda” from a “Russian agent”? I am not worried about the slander and lies of Carvalho, but about the almost submissive way in which Bolsonaro follows his “suggestions.” Since Carvalho has put his own person as an uncriticizable subject of national security that deserves to be protected by the Federal Police against an “intervention” of the Russian government in collusion with me against him, I will repeat what is already notorious. I traveled to Russia in 2014 for a big pro-family conference at the Kremlin. I did not attend it alone. I was with evangelical, Catholic and Jew leaders from the United States. Unlike Carvalho, who boasts of having links with American occultists like Steve Bannon and Wolfgang Smith (both adherents of the Islamic occultist René Guénon), I have connections with pro-family leaders in the United States. I have already attended large pro-life Catholic conferences, including in Aparecida and at the headquarters of the National Conference of Catholic Bishops of Brazil, at the invitation of national Catholic leaders. After this participation, many called me a Catholic or enthusiastic Catholic, especially since I also participated in the founding of great Brazilian pro-life Catholic movements, including the National Pro-Life and Pro-Family Association in 1994 and the National Pro-Life and Pro-Family Network in 2007. My deep connection to the Catholic pro-life movement since the 1980s has made me to be seen as an enthusiastic Catholic. Many of these trips and participations were paid by Catholic leaders. But I have never been accused of being a “Catholic agent.” Will Carvalho now want to produce a video urging the Federal Police to investigate if I am a Catholic agent paid by the Vatican? I attended a single Russian pro-life event, along with U.S. pro-life Jewish, Catholic and evangelical leaders, and I’m being accused by a man who never had the support of these U.S. leaders. While the American left accuses Trump of collusion with Russia, Carvalho makes the same accusation against me. I made a single trip to Russia. Thus the accusation of Olavo de Carvalho that I have made several trips to Russia is simply slander. His accusation that such travels were paid by the Russian government is also slander, since the trip I made to Russia was exclusively funded by voluntary donations from Americans and Brazilians. My trip to Russia was encouraged by Dr. Scott Lively, one of America’s greatest evangelical leaders. To claim that my exposés are motivated by a “Russian conspiracy” paid by the Russian government constitutes slander, because before traveling to Russia I was already denouncing Carvalho because of his advocacy of the revisionism of the Inquisition, which tortured and killed Jews and Protestants. The revisionism that Carvalho advocates diminishes and even denies the suffering, torture, cruelty and deaths of these Jews and evangelicals. As far as I know, the theme of the Inquisition has nothing to do with Russia. So to deal with Carvalho’s pro-Inquisition obsession, what helped me most was American literature. No country in the world produced more books against the Inquisition than the United States. So, on this important subject, my base is the U.S., not Russia. Is Carvalho going to say that there is an American collusion with me against the Inquisition? Interestingly, the Inquisition alleged accusations against its Jewish and Protestant victims and put all the state force against them for their view against any dogma of the Catholic Church. In the spirit of the Inquisition, Carvalho is using the same kind of low blow against me. I have disagreements with Catholicism, but that has never prevented me for more than 30 years from supporting Catholic efforts, including from the popes, to defend the lives of babies against legal abortion. I have disagreements with Russia, but that does not stop me from supporting the exemplary Russian law that protects children and adolescents against homosexual propaganda. I also support other conservative measures from Russia. I have disagreements with the U.S. government, especially regarding the neocons and its nasty support of the Islamic dictatorship of Saudi Arabia, but that does not stop me from supporting the U.S. pro-life movement. I also have meetings with American evangelical leaders. In fact, when I was at the pro-family event in the Kremlin, there was also the greatest member of the Inter-American Institute, which Carvalho claims he founded, but which was actually founded by John Haskins, an astray evangelical. The sole purpose of the existence of such an institute, which has no activities, seems to facilitate visa issues for members of the Carvalho family. Shouldn’t it be investigated by the FBI? If Carvalho wants to insist on his slander campaign that because I went to the pro-life event in Russia I am a kind of paid agent of the Russian government whose trip was paid by the Russian government, he has an obligation to make the same accusation to the member of the Institute Inter-American. More: He has a legal obligation to prove what he is saying. He will have to raise the same slander against all the U.S. evangelical, Catholic, and Jewish leaders who attended, just like me, the pro-family event in Russia. Interestingly, Dr. Larry Jacobs of the World Congress of Families told me in Moscow that homosexual and leftist organizations were pressuring the U.S. government, which was then under Obama, to investigate all Americans who dared to attend the Russian event. Obama had imposed sanctions against Russia, so the World Congress of Families could not officially take part in the event, not to be punished by Obama. But many of the World Congress of Family leaders, including Jacobs, attended the event, even under the threat of homosexual and leftist organizations that wanted them to be investigated by the U.S. government for collusion with the Russian government. In a delayed effect, now Carvalho wants against me the same governmental pressure that homosexual and leftist organizations wanted against the U.S. pro-life Jewish, Catholic and evangelical leaders who dared to take part in the pro-life event in Russia. In any case, Carvalho has an obligation to launch the same slander against all the Americans who went to the event. He’s going to have to prove that they and I are all paid agents. my challenge is for a commission of international investigative officials to examine our bank accounts (of me, Hank, Kincaid and Carvalho) to reveal to the world our financial sources. Let us open our financial books. Let such a commission investigate us. Only in this way will everybody know who is really being paid to lie. After 4 years, Carvalho has not yet accepted the challenge of opening his bank accounts for investigation. It would be a shame for the Bolsonaro administration to call on the Federal Police to satisfy the slander of a man who has lived as a self-exiled immigrant in the United States for 15 years and does not open his own accounts for investigation. Instead, from a distance, he prefers to sit in his chair smoking a pipe and causing confusion among everyone, from generals to an evangelical blogger. However, it would be interesting for the Bolsonaro administration to call on the Federal Police to investigate the real reasons for Carvalho’s flight from Brazil. He claims that he received “thousands” of threats and that he had to flee because he had no support. How could he have no support? One of his children worked for the police and he already had friends in the Federal Police, including Eduardo Bolsonaro. Neither of them wanted to help him? Did he send a copy of these “thousands” of threats to all his friends and relatives in the police? Carvalho’s case is not, as he claims, a national security case that merits actions by the Federal Police against an evangelical blogger who denounces his connections with the occult and exposes his insanity minimizing and even denying the suffering and death of Jews and Protestants under the Inquisition. Yet, his case may be national security because of his attitude of slander, falsehood and lies to self-promote himself, causing confusion and conspiracies even against generals. There are other important issues that also deserve to be investigated. Has Carvalho properly paid his income taxes in Brazil and the U.S.? Has he hired for 15 years Brazilians with a registered job at his house giving them visas following American law or, as a cult leader, did he use schemes to get free work by volunteers deceived by his power of persuasion? Why did he need the Inter-American Institute to get visas for his family? Cannot the Federal Police investigate this? Cannot the FBI to investigate this? In my case, if the Federal Police is driven by the Bolsonaro administration to investigate me, it will find out that for more than 10 years I worked at Carvalho’s Mídia Sem Máscara website, which I thought was conservative, Catholic and pro-life. While I worked for free, without ever having received a single penny of salary, the site received various sponsorships, even from large companies. Have such sponsorships been declared to the IRS? Can the Federal Police make an audit of Mídia Sem Máscara and its sponsorship profits? If the sponsorship money never went to pay columnists’ salaries, where was it going? Do labor laws allow such an arrangement, where a site profits from sponsorship and columnists get nothing? Perhaps to ease his conscience, later, once or twice, Carvalho appealed to the public to help me, as if that compensated for the absence of salaries for me for more than ten years. Inciting the Federal Police against an evangelical blogger, who was used to work for free for a man who took advantage of more than ten years of his work as a columnist in Mídia Sem Máscara, is the attitude of an opportunist. To slander the victim who was used for more than ten years in free labor is treacherous. It is the conduct of a treacherous opportunist, typical of adherents of René Guénon. But like communists, who love to portray themselves as victims while oppressing and threatening, Carvalho portrays himself as a victim and portrays me as the oppressor. What is the Bolsonaro administration, who seems to love the video “suggestions” of Carvalho, going to do with the “suggestion” of the latest video of the treacherous opportunist against me? Will it charge the Federal Police to investigate the treacherous opportunist or his victim?